How Samantha BartiLson lives her politics, embraces her role as the Matriarch, and counters the toxic versions of masculinity that almost killed her. Samantha Bartilson looks like her mother. She angles her jaw and tells me her lineage can be traced back to the Vikings—her mom’s side, her dad’s side; the slippery math of genetics when it comes to facial hair, or the length of one’s legs. Before she went on hormones, Samantha could only think of herself as a collection of sharp parts—snapped together in all the wrong places. It was inescapable; that itch to have those bras and dresses folded into the backs of cupboards. Before she came out, Samantha hid here. With great and meticulous care, she entombed her femininity, and anything good that might have come along with it. For years she was an infernal machine, filled to the brim with a blind rage that kept anyone from getting close enough to really see her. To remain unseen, for all those years, was a deep and lonely process. But eventually, it worked. For nearly fifty years, Samantha buried everything. She got married and had children of her own; and even after years of counseling, she found herself still weighted at the ankles by the deepest, heaviest kind of shame. But things are different now. Transitioning laid bare every inch of what Samantha had worked so tirelessly to conceal: she was always this woman, somewhere beneath the man she built with whatever parts she could find. Samantha’s dad still struggles with her name, and her pronouns. Some days are better than others. This week, he loaned her his truck when hers broke down. There is love in those subtleties, but not always an understanding. For most of her life, Samantha’s shame and fear backed her into a corner of poisonous masculinity. She was a coil of rage, always hovering at the edge of some explosion. The local metal scene became her only lifeline. For years it was her only home, fan and crowd and community, screaming her throat raw in the thrill of the record coming alive onstage. These shows defined her, and they saved her. It was there, pressed between the bodies of the screaming crowd, that she could let some fraction of herself come to the surface. An earring, a bracelet, the feel of her own hair long against the nape of her neck. At the foot of a stage, she could let herself have those things. Not a soul would look twice. And for a long time, that was almost enough. It’s been more than ten years since her mother-in-law’s funeral. And things are different for Samantha now. 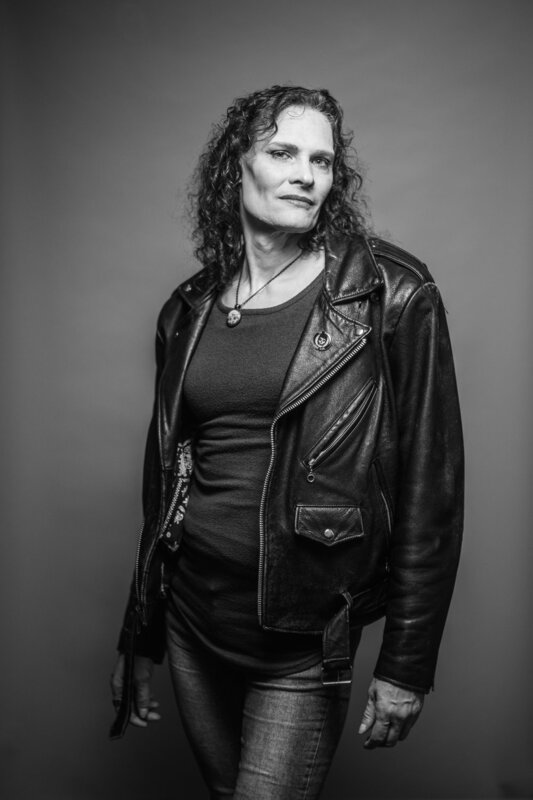 After years of counseling and finally coming out as a transgender woman, she’s no longer shackled to rage or cruelty. Samantha’s kids dart from one room to another in blurs of color. They’re still in elementary school, and they laugh under a string of carnival lights, happy to play with their new friends. Samantha wants things to be different for them; and she pushes toward that difference every day. She's gentle with her kids—and especially with her son. She's helping him build an identity that lets him embrace something other than rage; like kindness, or patience, or vulnerability. For years Samantha strategize, waited until she was alone, and slipped into any piece of feminine clothing she could get her hands on, if only for a few minutes at a time. I was just absolutely positive [being transgender] was something wrong and perverse. I just knew it was something I could never, ever let anyone know about me. In larger cultural narratives, Samantha’s experience in collecting and purging clothes designed to be worn by cisgender women might be referred to as crossdressing, or dressing in drag. But Samantha doesn’t perform drag, and never has. And she’s not crossdressing, partly because clothes themselves have no assigned gender, and partly because she is a woman and always has been. Samantha never told anyone about the clothes. By the time she was in junior high, she had already seen one therapist, and then another. She never mentioned all the hours she’d spent in front of her own reflection—the fabric against her skin. She never mentioned her sexuality, or that horrible weight shifting at the center of her chest. Drag performance and culture has a long and storied history that is equal parts horrifying and liberating. And while mainstream drag is often exclusive, transphobic, or even racist, drag has been shaped by queer, trans, and gender non-conforming people for nearly a century. Anyone can perform drag. And, according to transgender drag queen Peppermint in an interview with Mic discussing RuPaul Charles' most recent transphobic remarks, drag can and must be radically inclusive in order to take a real stab at the oppressive structures it seeks to dismantle. Many transgender women believe that elements of current mainstream drag culture, which has been almost single-handedly crafted by RuPaul Charles, are harmful, exclusive, and even dangerous for trans women. For Samantha, cisgender drag queens play up a misogynistic performance of femininity, a garish, cartoony joke that devalues the lived realities of trans women and makes it harder for them to exist safely in public spaces. Mainstream drag often fails to differentiate between the trans experience and the layered gendered performance of drag. And that, Samantha says, it why it’s so dangerous. In the summer of 2016, Samantha moved into her own apartment. There, she lived on her own for the first time in her life, with a new name, in a new city. Every single day, Samantha left the house in full makeup. She spent hours in front of the mirror, touching and retouching her face to perfection. The makeup and hair and clothes kept Samantha safe in public spaces. If she could pass as a person assigned female at birth, she was less likely to be harassed or attacked. “I only started telling people about this because I think it’s important,” Samantha says, looking away at the passersby outside on the sidewalk. I ask her if she ever told them—her mom and dad, if she ever explained that she had been too scared to go in the bathroom with all those boys. That she wasn’t like them. She shakes her head. "No," she says. “I never told anybody.” Samantha’s shoulders sink back into the shape of that little kid. “I started telling this story because I just want people to know,” she says. “I want people to really know what trans kids will do to themselves when they’re scared, or when they're ashamed—or when they don't feel safe." More than 69% of trans and gender non-conforming people who pursue a social or medical transition between the ages of 45 and 54 are already parents; and the support they do or do not receive from their children and partners can mean the difference between life and death. In the weeks and months immediately after coming out, many trans and gender non-conforming people report that their familial relationships get worse, or even dangerous, and then slowly improve. Around 21% of all transgender people who are parents report that at least one of their children chose to stop speaking to them or spending time with them, either permanently or temporarily. Among all trans people who are parents, more than 70% report that they maintain healthy relationships with their children long-term. However, relationship outcomes between trans parents and their children vary drastically by race, ethnicity, levels of educational attainment, and household incomes. It's sometimes difficult to track and categorize the complexities of supportive behaviors and unsupportive behaviors over time; but available data does show that trans and gender non-conforming people can be deeply affected by violence and rejection within their families. More than 40% of all trans and gender non-conforming people experience negative or unsupportive reactions when family members refuse to use the correct name or pronouns, or choose not to speak to or spend time with them. Even worse, more than 10% of trans and gender non-conforming people report having experienced family violence as a direct result of their gender identities in the weeks and months immediately after coming out. Experiencing violence at the hands of a family member more than doubles a trans or gender non-conforming person's chances of experiencing homelessness, and nearly doubles the likelihood that they will attempt suicide. A year ago, two guys approach Samantha outside of a bar. She’s with her niece, and the men taunt them, hounding her on the sidewalk. “You’re a man,” they say. “No,” she tells them. “I’m a woman.” They call her a man over and over. Finally, she tells them she’s a transgender woman, but a woman all the same. Samantha blinks. She’s connected the dots. And even if he doesn’t hurt her now, he might some other night; and if not her, then some other woman. Matthew Shepard was murdered in Laramie, Wyoming in the fall of 1998. Aaron McKinney and Russell Henderson offered him a ride home. They tied him to a fence post, severed his brain stem, and fractured his skull. They left him there to die, on that unforgiving prairie. When they found his body after sunrise, his hands were still bound—his small frame so twisted they thought he was a scarecrow. The first police officer on the scene cleared an opening through his airway with her bare hands. Later, in interviews, she said that his tears had washed away the stain of blood in two clean streaks across his temples. He died six days later. For trans, queer, or gender non-conforming people, this world can be a dangerous cage—a nervous tremor or a deafening roar. At any moment, they might become a casket—a framed photo; a pile of flowers at some makeshift memorial. Samantha has this dream where she walks alone through some nondescript apartment complex—the low buzz of a street lamp, muffled chatter floating from some open door. She spots a crowd of men leaning against the doors of a parked car. She picks up the pace. They leave the car and corner her like prey, angling from the other side of the parking lot. They zero in. Samantha walks faster but they’re close and she breaks into a full run. An open palm slaps against her back and pulls her shirt into a fist. She wakes up. Caught in a loop of real or unreal, this dream must be both the mind's creation, and a potential fact—a dated box on a calendar, or a name on a stone. Later that night, after Samantha and her niece make it inside the bar, those men from Wyoming spend all night on the dance floor. They drink and laugh and take up space. When one of them sees Samantha standing at the bar, he approaches her. "What's wrong?" he says. "Give us a smile, sweetheart." Samantha crouches behind her kids, backlit by the lights of a Christmas tree. This Christmas is her first Christmas as Samantha; the first Christmas she'd spend in her own apartment, on her own in the world, living in a new city. They'll spend Christmas Day together, Samantha and her ex and their children. Her ex sets her phone up in front of the tree. The timer counts down and Samantha’s ex scurries toward her and the kids—already posed and smiling—trying to beat the seconds. They take one photo, and then another. A family like any other family; crooked and mending—learning to build new traditions around the old one. Learning to love one another in all the ways that fit. Samantha is more herself this Christmas than she has ever been before. And she is beautiful, like her ex always said she would be. She tells me she sees herself as a woman all the time now; never as an alternative, or an almost. Every Christmas is a birthday; and for Samantha, it is a marker of this broken, triumphant year, and all the years that will follow. Next Christmas, Samantha will be here, with her children and their mother, just like this year and the year before. But next Christmas, things will have shifted again, for better and worse. Next Christmas, Samantha and her ex-wife will sit in this same room, bathed in the glow of the same lights. Next year, they’ll watch their children open presents. They’ll crowd in front of the tree, but they’ll take separate photos. Samantha is wearing a skirt when she gets a call from her ex-wife. The kids need food for their lunches, and Samantha has to pick it up. She could go to the Whole Foods a few blocks away—but she's wearing a skirt, and a shirt that hugs her torso, and she hasn't shaved her facial hair. She sits in the parking lot watching people file in and out with their shopping carts. She gets out of her truck, and then climbs back in again. “I had no backup,” she says, shrugging. “But I knew I had to do it then, or I never would." Eventually, Samantha makes it to the door. She wanders through the aisles, a little closer to who she’s always been, tossing lunch meat into an empty cart and losing her breath, panicked at the thought of confrontation. No one said a thing to Samantha that day. No one looked at her; no one slowed to gawk or whisper. The thing about courage is that it sometimes looks a lot like shopping for lunch meat; or like climbing out of a parked car, and then climbing back in, and then back out one more time and through a single set of sliding automated doors. Sometimes, tenacity is seemingly average; tapping a shoe in the checkout line, waiting to be cashed out. Two years ago, when she came out as trans to her now ex-wife, Samantha promised to never pursue a medical transition. Her wife asked her not to, out of fear or shame. And Samantha agreed. It could only make things worse. But in the spring of 2015, Samantha started attending support groups. By summer, she knew she had to transition. Spoken word poet Neil Hilborn writes about suicide as a thing to be lived with; a thing that creeps in and then away slowly—day after day, year after year. For Samantha, the thought of it became mundane; hung in the workings of her daily life like a blouse on a clothesline. Dishes in the sink. The incessant drip of a leaking faucet. “The prospect of seeing my children grow up was no longer sufficient reason for me to stay alive. I remember having that exact thought,” Samantha says, pinching her eyes shut. Samantha and her wife separated soon after. But they did it because they loved one another, not because they didn’t. That’s something Samantha deals with every day; something she and her ex will navigate for the rest of their lives—raising children together—learning to love one another in different ways. It was a complicated exchange; Samantha chose herself, for the first time in her life, knowing she might pay a huge and irreversible price. Out on the cold sidewalk Samantha stands under a streetlamp. She zips her sweatshirt up to the neck and stuffs her hands in the pockets. Behind her, in the coffee shop, the barista runs a vacuum over the rugs, a single light still dulled in the window reflection. I lived as an angry boy and an angry young man. I knew I had to transition, or I was going to die an angry, sad, middle-aged man. “I’d thought I’d lose everything,” Samantha says. “I thought I’d lose my marriage. And that happened. I thought I might lose my job—and that didn’t happen." I think of her crouched in front of the Christmas tree, finally unshackled; no longer an impending blast. No longer pinned beneath a masculinity that nearly killed her. When she finally filled that prescription, Samantha toasted her first dose of hormones alone, with a special imported beer. “It’s called La Fin du Monde,” she says. “It literally translates to ‘The End of the World.’” Samantha smiles, sly and grateful; proud of that symbolism.